In this exquisite lullaby, the beauty and wonder of a northern winter night unfold, with images of a soft snowfall, the wild animals that appear in the garden, the twinkling stars, the gentle rhythm of the northern lights and the etchings of frost on the window pane. As the young child sleeps, wrapped in a downy blanket, a snowflake falls, and then another and another. The poem describes the forest of snow-covered pines, where a deer and fawn nibble a frozen apple, and a great gray owl swoops down with its feathers trailing through the snow. Two snowshoe hares scamper and play under the watchful eyes of a little fox, and a tiny mouse scurries in search of a midnight feast. When the snow clouds disappear, stars light up the sky, followed by the mystical shimmering of northern lights - all framed by the frost on the window. Jean E. Pendziwol's lyrical poem reflects a deep appreciation of the magic of a northern winter night where, even as a child slumbers, the world outside does not rest but continues its own natural rhythms. 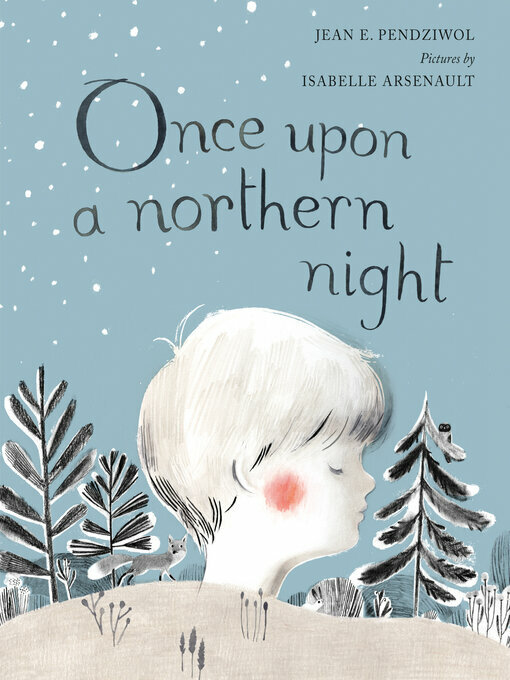 Isabelle Arsenault's spare, beautifully rendered illustrations, with their subtle but striking use of color, make us feel that we too are experiencing the enchantment of that northern night. They simultaneously evoke winter's nighttime life and the cozy warmth and security of a beloved child's sleep.